Homemade pie, chili, watermelon, potato salad, bbq chicken, and at least 20 accordions...good times to be had by all. 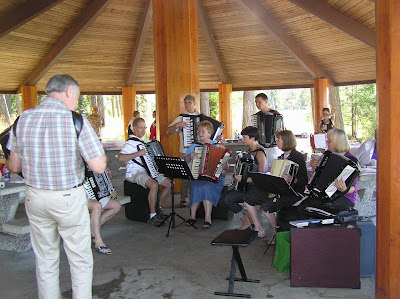 The Victoria Accordion Club meets on the first sunday of every month and the usual location being the Victoria Edelweiss Club, but this September meeting was a potluck picnic located at a gorgeous park on a lovely Sunday afternoon. There was food, food, and more food. 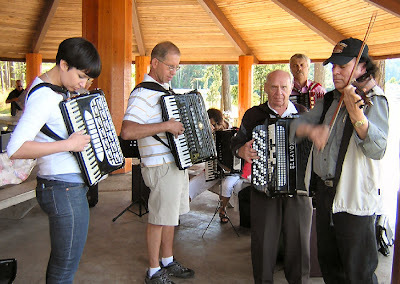 I brought my accordion wear goods, but most importantly there was lots of playing which is all I care about. 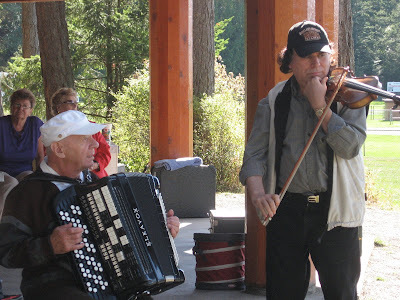 At one point the violinist and ex-concertmaster from the Victoria Symphony -Pablo, showed up and jammed with us as well. Anyways, it was a lovely day, with lovely playing.